We give our infinite thanks to El Clasificado for lending a hand once again in this Juguetón and for actively helping this cause that has grown little by little since we began in Los Angeles six years ago. 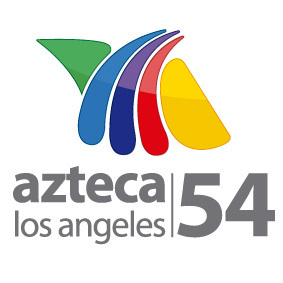 Last Sunday, December 15, Juguetón 2013 took place in the city of South Gate, California, where journalist and host Jorge Garralda, the Azteca América talent, and El Clasificado, among many other donors, made sure to put on a smile on each of the children in the community. El Clasificado gladly took part in this noble cause for the second time, donating over 400 toys that brought smiles, dreams, and hope to thousands of underprivileged kids. 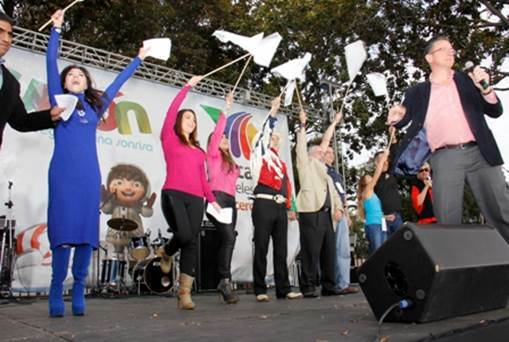 On behalf of Azteca América and Fundación Azteca, Jorge Garralda, leader and founder of Juguetón, delivered each and every donated toy personally, together with newscaster Alejandro Villalvazo and other prominent figures in the entertainment industry such as Aline Hernandez, Patricia Arbulu, Salid Garcia Solis, Adriana Yañez, Alex Cambert, and Mayte Prida. The event was inaugurated in South Gate at noon with a cheery Christmas parade. Live music was performed by Luis Coronel and Erika Vidrio as well as Rosalina, winner of the hit music reality show "Quiero Ser Grupero," who took this opportunity to present her latest album and liven the crowd. Martha de la Torre, Founder and CEO of El Clasificado and EC Hispanic Media, said she felt honored and glad to be able to take part in this project. "We hope to continue to support the Juguetón and this cause, which, in addition to bringing hope, helps stimulate the imagination, creativity, and innovation of children in our Hispanic community," she states. Likewise, Ricardo Becerra, marketing manager at Azteca América, thanked the media for its support, with a special thanks to El Clasificado: "We give our infinite thanks to El Clasificado for lending a hand once again in this Juguetón and for actively helping this cause that has grown little by little since we began in Los Angeles six years ago." 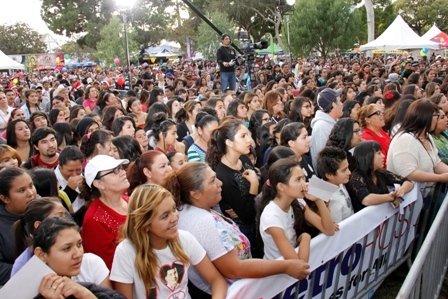 During its sixth event taking place in the United States, Juguetón 2013 reached its goal of 30,000 toys and carried out a successful event where the Hispanic community made its presence felt with approximately 75,000 people. The thousands of children who came to the event from cities such as Lynwood, Compton, Long Beach, Huntington Park, and South Gate, not only received their toys, but also a feeling of hope as a result of the kindness that exists among Latinos in Southern California. El Clasificado has been involved in charitable events that help the Hispanic community since its foundation. 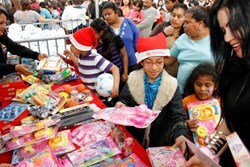 During the most recent event, Juguetón 2013, the annual toy drive organized by the East Los Angeles Chamber of Commerce, the publication donated 70 toys for children of all ages and raffled away two new bicycles. The event took place at the East Los Angeles Public Library, an area characterized by its high levels of poverty and marginalization. Jorge Garralda, famous host of the television show, "A quien corresponda," aired on Azteca América, founded Juguetón in 1995 in order to bring hope and happiness to children throughout México who live in marginalized communities, poor areas, or have been orphaned. Since then, Fundación Azteca partnered with the charity. The efforts of the charity has grown and so has the kindness of people, which crossed borders and expanded to reach the United States in 2007. Here, it has slowly grown into a charity that brings happiness to those children who wish for a toy and open their hearts to those who are generous enough to donate them. El Clasificado, an EC Hispanic Media company, is a multi-media publication and advertising solutions company with advertising platforms in print, online, and grassroots events. More than 1.5 million readers utilize the free Spanish language publication every week. El Clasificado, a verified publication with a weekly circulation of 510,000, is distributed in over 300 cities throughout Southern California, the Central Valley, and now Yuma, Arizona. EC Hispanic media also owns the monthly publication El Punto and special supplement Quinceanera.com and the websites, elclasificado.com, pacoslist.com, susociodenegocios.com, alborde.com y quinceanera.com. Alicia García de Angela, Director of Events and Communications, agarcia(at)elclasificado(dot)com, 323-837-4086.